Our sources tell us that Connor Mitch is going to be named the starting quarterback for the UNC game any day now. Heck, maybe any minute. It’s possible he’s being named the starting quarterback RIGHT NOW. If so know that we were typing this information at 8:13 p.m. on August 24 so we had the information before anyone else. Mitch might get the start, but he will be on a short leash. He threw two interceptions in the scrimmage on Saturday, and in football turning the ball over is bad. So if Mitch does bad things like turn the ball over or not complete passes, it’s possible he could be replaced. Don’t be surprised if the Gamecocks try to establish a running game against UNC to make things easier on Mitch. You don’t know this because you’re not privy to behind the scenes info like we are, but establishing a running game helps take the pressure off a young quarterback making his first start. Also expect to see Lorenzo Nunez play some at quarterback as well. He’s very young and doesn’t know the playbook well. But don’t tell anybody, that’s some serious down low information that we don’t want to get out to the competition. Brandon Wilds will get the start against UNC at running back, but don’t be surprised if David Williams gets several carries as well. Sit down for this one – but Shon Carson might even get to carry the ball if the situation calls for it. Our insider tells us Elliott Fry is poised for a big year kicking the ball, because word out of camp is he is good at kicking the ball. Shon Carson may or may not return kickoffs this year. He is ready either way, because he’s Shon freakin’ Carson. On the defensive side of the ball, now that Jon Hoke is calling the shots, look for the Gamecocks to run different schemes and alignments that we used last year. Hoke teaches a more “ATTACK!! !” style defense, but occasionally asks his defenders to “read and react”. We’re not sure which he prefers, but you can expect to see one of those two things. Several players have lost weight and are in the best shape of their careers. Our 7-6 record can be directly attributed to how fat our players were last year, so it’s good to hear they worked out during the offseason and maybe had a salad. 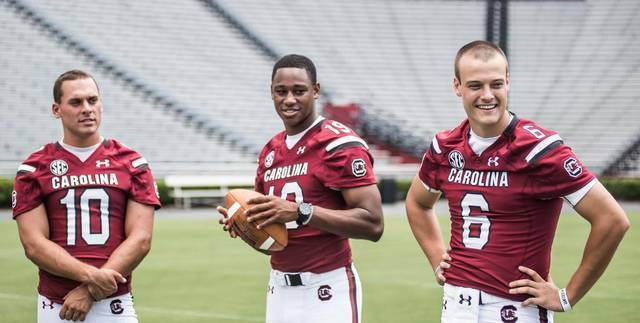 The Gamecocks are going to try to limit the amount of penalties they commit. That is an area that has been talked about some. Not sure exactly how much, but I’m sure it’s come up. If USC wins the opening toss against UNC, we’re told Steve Spurrier will elect to receive. But don’t be terribly surprised if he defers until the second half. Our sources tell us Spurrier sometimes changes his mind about things. Again, please, please don’t share this information anywhere else on the internet we will get in so much trouble with Mr. Tanner our contact. We trust you. You guys are awesome! It’s unreal how you can pull off getting all that info that has been kept such a secret. Do you also know who will be punting! Thanks in advance! WOW!…..just the nitty-gritty I have come to expect…. Any insight on new, madcap capers involving Cocky? Cover your eyes. The sky is still, and always will be, Carolina Blue.